Glymphatic system is newly discovered pseudolymphatic system in brain and it plays an important role in the removal of interstitial metabolic waste products. We discuss and review the role of glymphatic system in neurological diseases, especially focus on the potential of MRI modelling and its associated challenges to obtain useful new information related to understand the glymphatic system dynamics, pathways, and provide quantitative maps for diagnosis, monitoring and prognosis of the disease. The non-invasive nature of MRI might more readily help with translation of glymphatic measurements from the laboratory to the clinic. Influx, CSF-ISF exchange and efflux of glymphatic system: The influx flow of CSF into brain through the para-arterial pathways and then exchange with ISF. The mixed CSF and ISF with interstitial metabolic waste are flowed towards paravenous pathways, and then go to lymphatic system. AQP4 water channels in both arteries and veins play important role in reducing the resistance to CSF movement between paravascular spaces and the interstitium. Reproduced with permission from25. AQP4, astrocytic aquaporin-4; CSF, cerebrospinal fluid; ISF, interstitial fluid. The glymphatic system plays an important role in neurological diseases.1–5 10 Xie et al demonstrated that natural sleep or anaesthesia significantly enlarged the interstitial space which increased convective exchange of CSF with ISF and clearance rate of β-amyloid during sleep.1 Ageing strongly relates to many neurodegenerative diseases and is also associated with a slow waste clearance in the brain.11 CSF tracer clearance was gradually reduced from middle-aged (12–13 months) to old (18 months) brain compared with young (2–3 months) brain.11 In mouse Alzheimer’s disease model, Peng et al found reduced clearance of β-amyloid and glymphatic influx which worsened with advanced age.10 Reduced waste clearance has also been demonstrated after traumatic brain injury, haemorrhage, hypertension, acute ischaemia and multiple microinfarction.5 12–16 In diabetes mellitus (DM) animal model, tracer clearance from brain parenchyma was significantly reduced with diabetes, leading to accumulation of tracers in multiple brain regions which correlated with degree of cognitive decline.17 Although glymphatic system has exhibited its important role in neurological diseases, further investigation is necessary to develop glymphatic directed therapeutic strategies. Most previous studies of the glymphatic system have been performed with two-photon laser scanning microscopy, which is precise and excellent for a predetermined small paravascular space but not a suitable tool for whole brain study, especially deep brain tissues and also invasive. 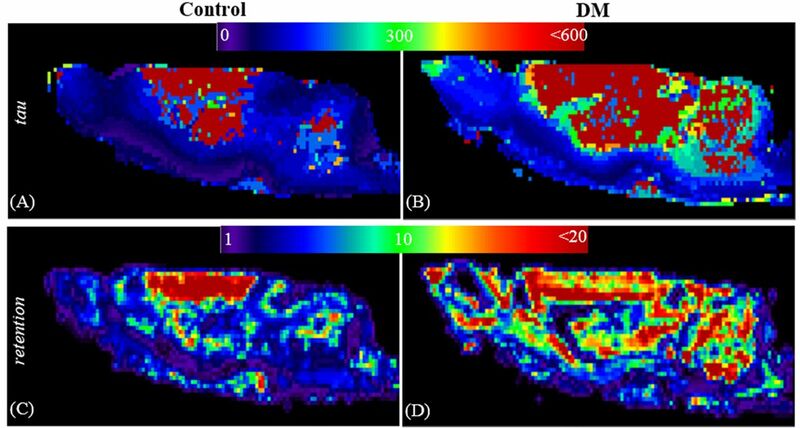 MRI overcomes the weak points of two-photon confocal microscopy and provides non-invasive whole brain dynamic real-time imaging of the glymphatic system. Iliff et al first employed MRI to monitor glymphatic function and demonstrated that MRI allowed the identification of glymphatic pathways, several influx nodes and some kinetic parameters to evaluate solute clearance in the brain.18 MRI has also exhibited its advantage to monitor whole brain pictures of slow waste clearance after subarachnoid haemorrhage and ischaemic stroke.13 15 16 A recent study has demonstrated that compared with middle-aged non-DM animals, tracer clearance from brain parenchyma measured by both MRI and fluorescence imaging was significantly reduced with DM.17 MRI cluster analysis measurement of glymphatic system also exhibits a significant increase in paravascular space in the DM animals compared with control animals. Most interestingly, the MRI measures of tracer clearance, residual intensity and paravascular space are highly sensitive indices of pathological changes occurring early during the development of DM compared with functional behavioural tests and vascular dysfunction. Although MRI measurements of glymphatic system have exhibited a great potential for non-invasive evaluation of whole brain glymphatic functions, properly modelling this newly discovered system is still challenge. So far, few studies have been published for modelling glymphatic system. Ratner et al19 20 identified the glymphatic pathways by using optimal mass transport to model the glymphatic flow vector field. Results from this study agreed with previous results of the glymphatic pathways. However, a weak point of this model is no quantitative measures of this system. Lee et al performed a very interesting study using kinetic modelling to quantify CSF-ISF exchange rates in supine, prone or lateral positions. This model exhibited the ability to differential the CSF-ISF exchange rates in three different postures and the quantitative maps derived from this model showed that glymphatic transport was most efficient in the lateral position compared with the supine or prone positions.21 One limitation for this model is its global input function which could produce more errors, especially for glymphatic system. A newly published model using local input function has exhibited its advantage for improving the detecting sensitivity of glymphatic system.22 This model employed cluster analysis to determine the similar regions with the time signal curves from dynamic contrast agent MRI data and then derive local input function based on signal exchanges between regions.22 The results from this new model exhibit its better sensitivity to differential diabetic and control animals than previous two-compartment kinetic model and show increased clearance time and binding of tracers in DM compared with control animal brain (figure 2). Arterial input using global input function is a long-standing issue and the major source of error in cerebral permeability and perfusion measurements. Although model-based approach had tried to improve the delay and dispersion issues and to derive the local input function in permeability and perfusion measurements,23 24 directly measure local input function is still a challenge. Compared with vascular system, the errors caused global input delay and dispersion in glymphatic system are more severe due to much longer delay and tissue involved dispersion. The newly published model22 provides a better approach for more accurate evaluate glymphatic changes under neurological diseases. The maps of quantitative modelling the glymphatic system for control and DM animals. Figure 2 shows the visual comparison of the clearance time constant, tau (minutes, (A, B) and the retention (C, D) maps under control (A, C) and DM (B, D) conditions. Comparing with the control, DM animal exhibits longer clearance time constant (slower clearance of the tracer from the tissue) and high retention values (large fraction of the tracer remains in brain tissue). DM, diabetes mellitus. Current MRI modelling of glymphatic system only considers a pressure-driven motion of bulk fluid referred to as ‘advection’. The waste clearance could also involve diffusion although it will play much less role in the waste clearance. The further modelling of brain waste clearance could include both advection and diffusion to further reduce system errors. Glymphatic system plays important role in neurological diseases. MRI could provide more information about glymphatic functions in whole brain study, especially deep brain tissues. Precisely modelling glymphatic system could obtain useful new information related to understand the glymphatic system dynamics, pathways, and provide quantitative maps for diagnosis, monitoring and prognosis of the disease. This work was supported by NIH grants RF1 AG057494, RO1 NS108463, RO1 NS097747 and R21 AG052735. I thank Li Zhang, Esmaeil Davoodi-Bojd, Guangliang Ding, Zhenggang Zhang and Michael Chopp for their contribution of the glymphatic studies in the Department of Neurology, Henry Ford Hospital. Contributors QJ is the sole author of the contribution.